If you wish to know exactly when your chosen APT satellite is going to appear above your horizon, you require the assistance of a satellite tracking program. 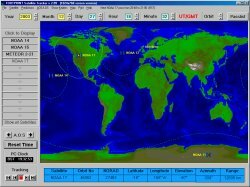 Footprint is a freeware program that is easy to approach for a beginner and provides all the basic facilities needed for predicting satellite passes over your location. The latest version is now 1024x768 resolution and has many new features.� � � Footprint. There are excellent commercial tracking programs on the market, but few can better the two shareware items described below. WXtrack is in continuous development, and has matured over the years, largely on the basis of suggestions from users. The program has been designed to predict the tracks of satellites both as paths above the earth, and as images produced by these satellites when scanning the ground. It is also possible to compile tables of predictions for your own area. WXtrack is free for amateur use but registration is needed if you want to take advantage of technical support from the author. WXtrack boasts a host of features including automatic 2-line element updating over the Internet, and will give the user hours of pleasure. � � � WXtrack. Satscape is a superb freeware program for the PC. It produces amazing real-time displays of satellite positions, on both 2D and 3D screens. Passes can be predicted for your own locale. Satscape can be configured to predict when the 150 'brightest' satellites pass over so you can view them in the night sky. 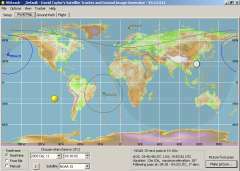 Up to 500 satellites can be tracked simultaneously. 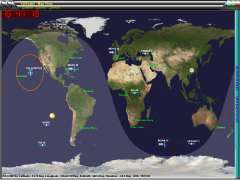 Satscape is highly graphical, and has optional speech to announce satellites as they come into range. � � � Satscape.